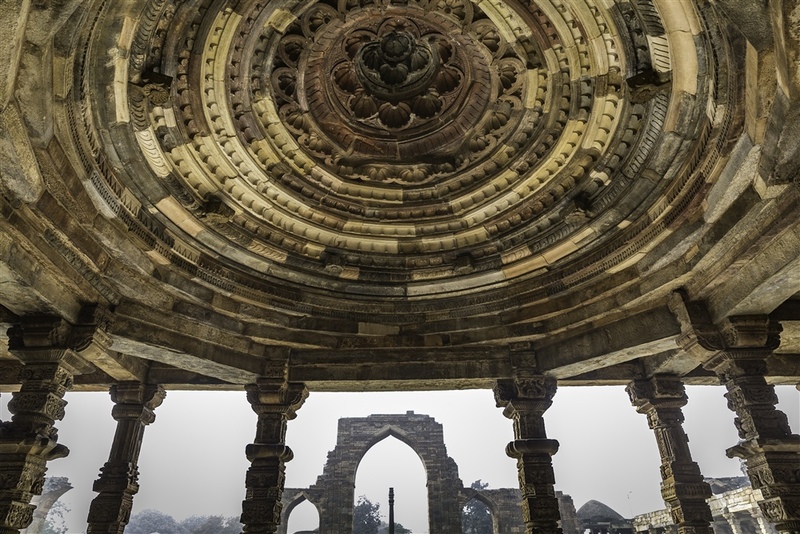 The Qutb Minar Complex is a 200m x 300m rectangular enclosure containing several important and impressive structures, located in the northern part of the Mehrauli district of south Delhi. My visit to the site in early 2016 coincided with what I think are typical conditions during the early part of the year in Delhi, so I was faced with not an insignificant amount of fog, haze, and most likely city smog. As a result, there’s going to be no award winning photography on show here, but hopefully this will give you a short insight into what there is to see in the complex. 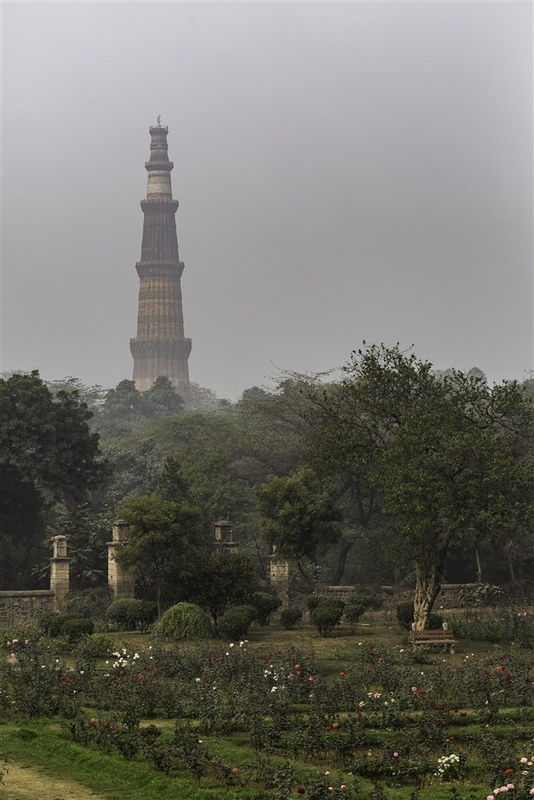 At 72.5m tall with a diameter tapering from 14m at the base to 3m at the top, this monument was once the tallest tower in the world and has dominated the Delhi skyline for over 800 years. It’s one of those rare historical buildings that is just as spectacular from close up as it is from a distance. 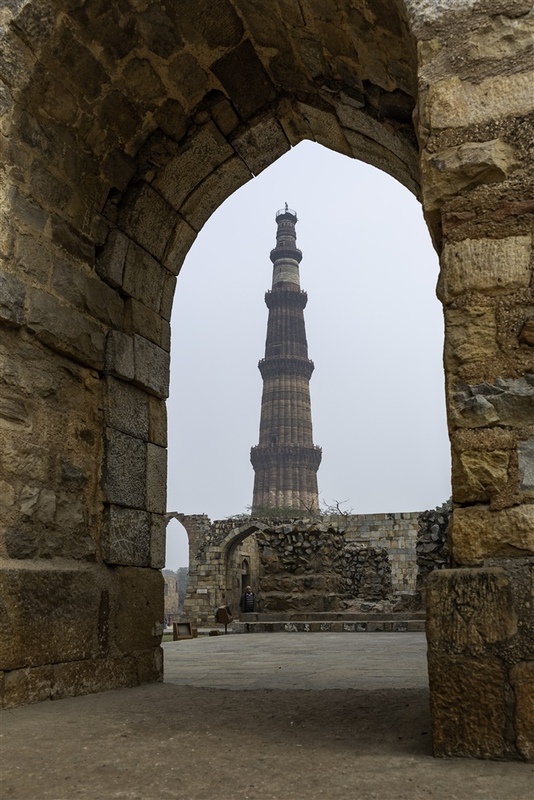 Qutb Minar literally means “axial tower”, and appears to have been dedicated to the Muslim saint Qutb Sahib, whose shrine is nearby in Mehrauli. 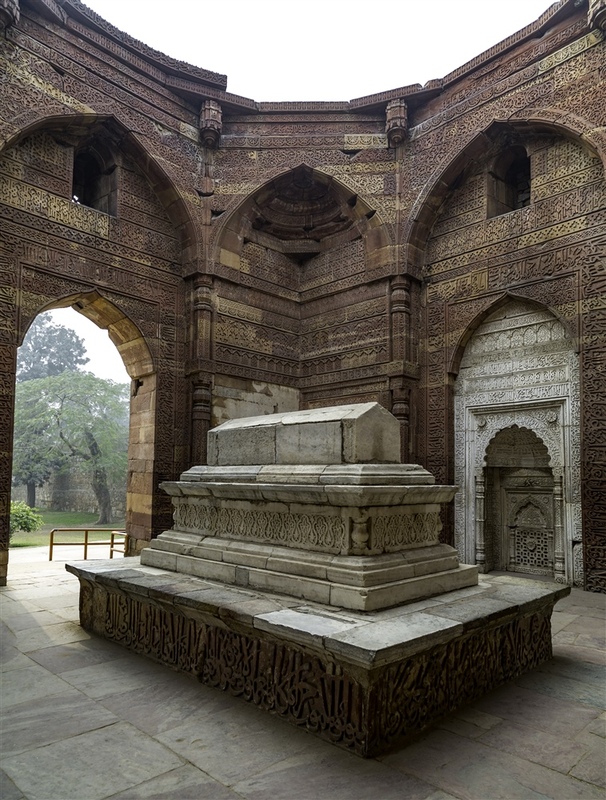 Construction is thought to have started in 1202 by the first sultan of Delhi, and completed by his successor Iltutmish whose tomb is also in the complex. Over the centuries it has been subjected to a number of alterations, if you look closely you will see that it has five distinct tiers, each one decorated differently. 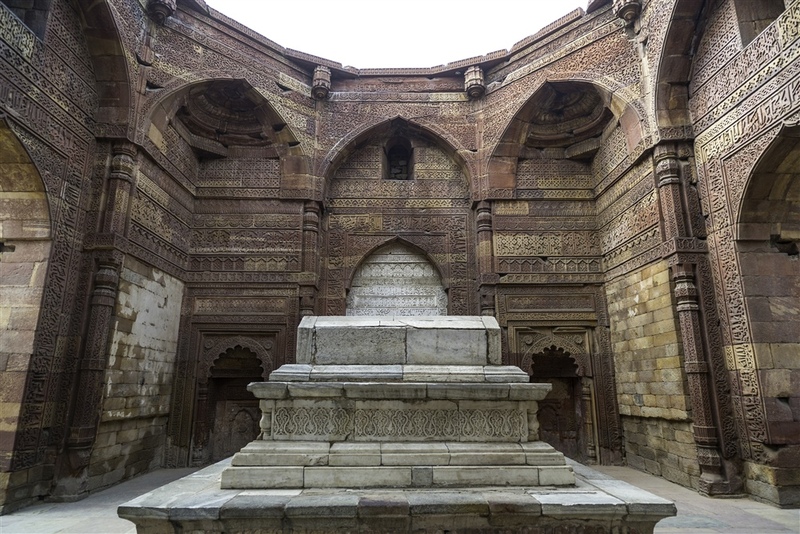 It was also struck by lightning in the 14th century, with the upper section restored using marble instead of sandstone by Feroze Shah Tughlaq. 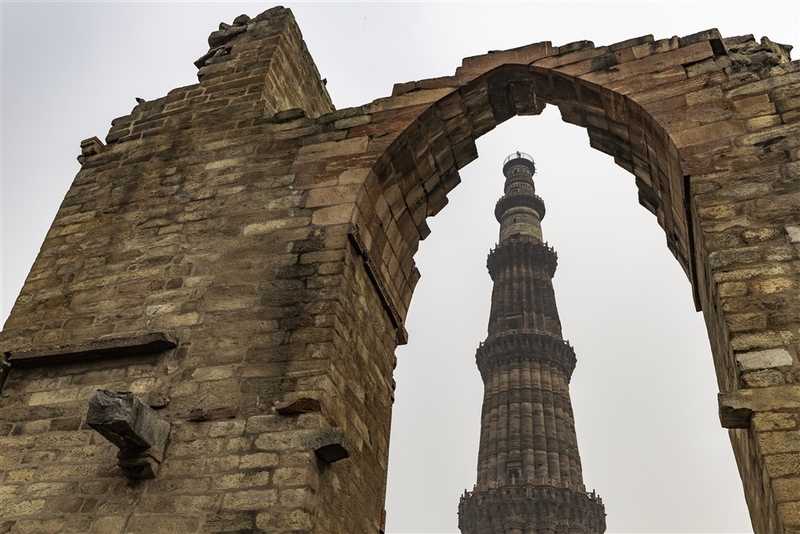 The 19th century saw further damage to the Qutb Minar, this time by earthquake. The resulting restoration this time included an additional cupola being added to the top. I’m not quite sure what they were thinking of at the time, and thankfully it has since been deemed inappropriate and removed, although you can still see the cupola abandoned in the SE corner of the complex. 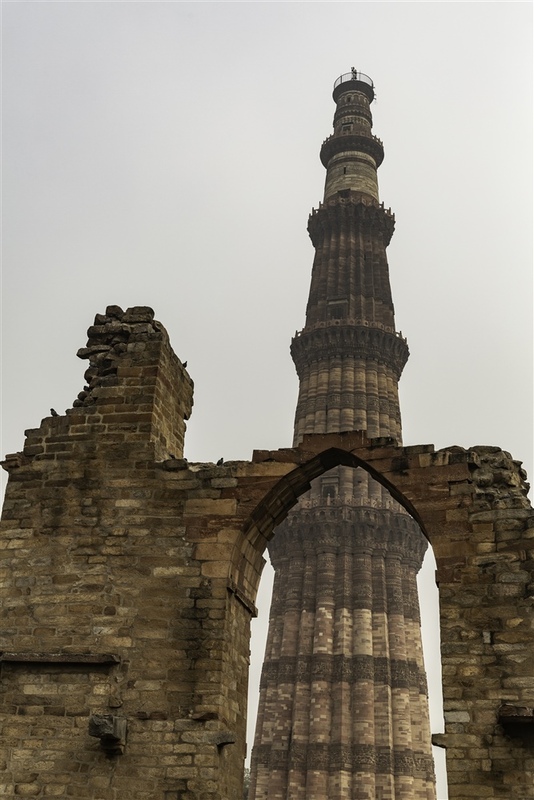 The Qutb Minar is not a solid structure, within there is a narrow spiral staircase that has been closed for many years. 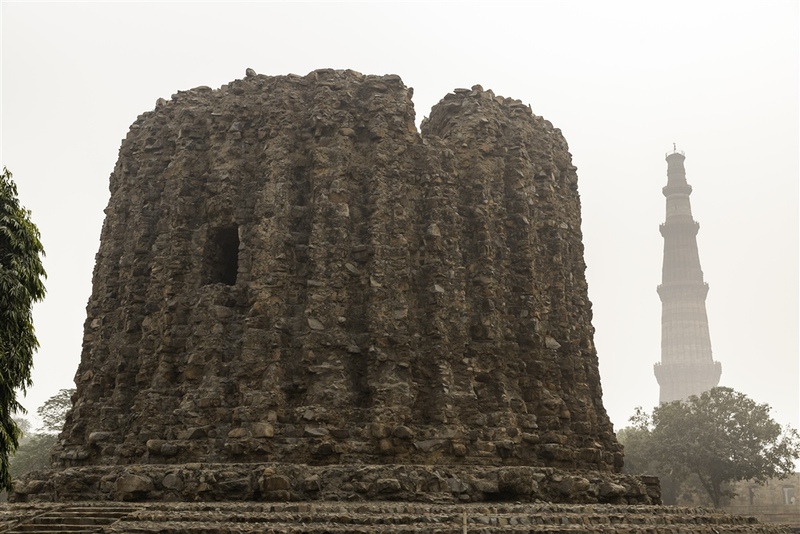 This has led scholars to think that it may have been used as a minaret or as a look-out tower. 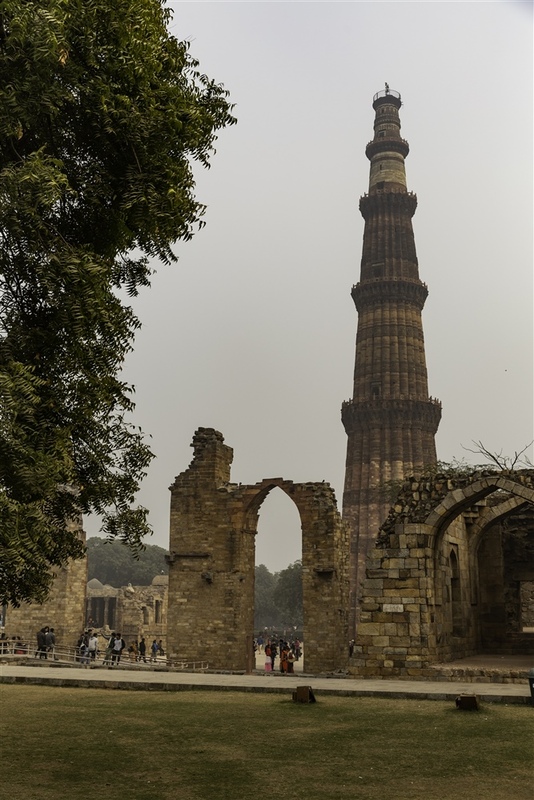 It is thought the inspiration for the Qutb Minar were the victory towers in Afghanistan, of which the Minaret of Jam is perhaps the most famous. 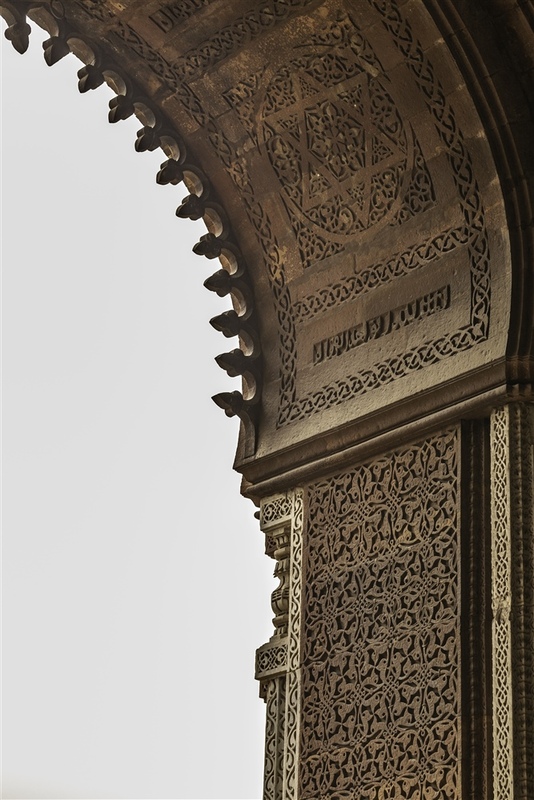 The difference however is that this monument is unlike any other contemporary Islamic structure in terms of workmanship, profile, and detail. As a result, some believe that the exterior of the monument was executed by local Hindu craftsmen. 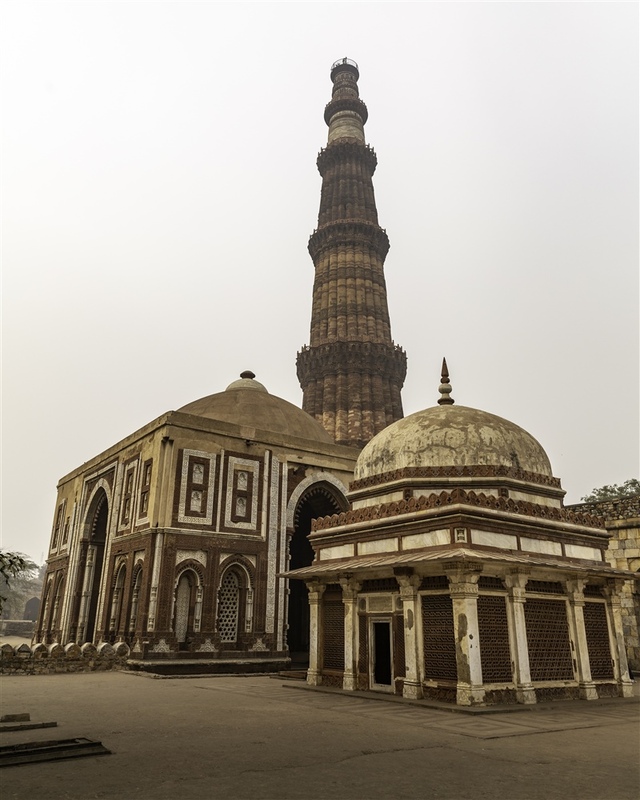 Also known as the Qutb Mosque, this is Delhi’s earliest mosque and slightly precedes the construction of the Qutb Minar by a few decades (late 12th century). The layout of this building, now in a ruined state, is slightly confusing due to the many alterations that occured by a series of sultans over the subsequent centuries. What becomes very clear as you walk around the columns in the colonnades is that this building had a former life. 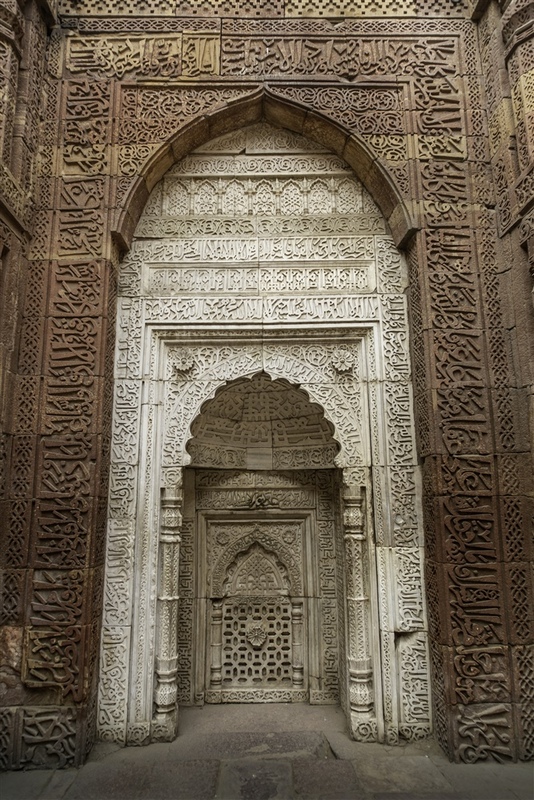 Hindu motifs such as ropes, leaves, bells and cows are everywhere, backed up by an inscription that states the mosque was built from the material of 27 demolished Hindu and Jain temples. It’s a little odd walking around a mosque that has such unlikely decoration, and of course sad that none of these Hindu temples were spared. 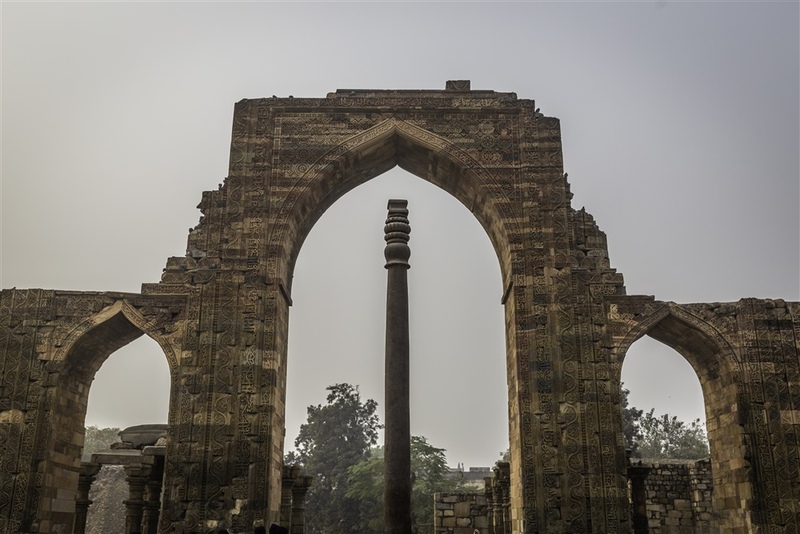 Although the Quwwat-ul-Islam Mosque may have been the first building constructed on the Qutb Minar complex, it is certainly not the oldest structure to be found here. This 7m high inscribed iron pillar stands in the middle of the mosque courtyard and dates back to at least the 4th century. 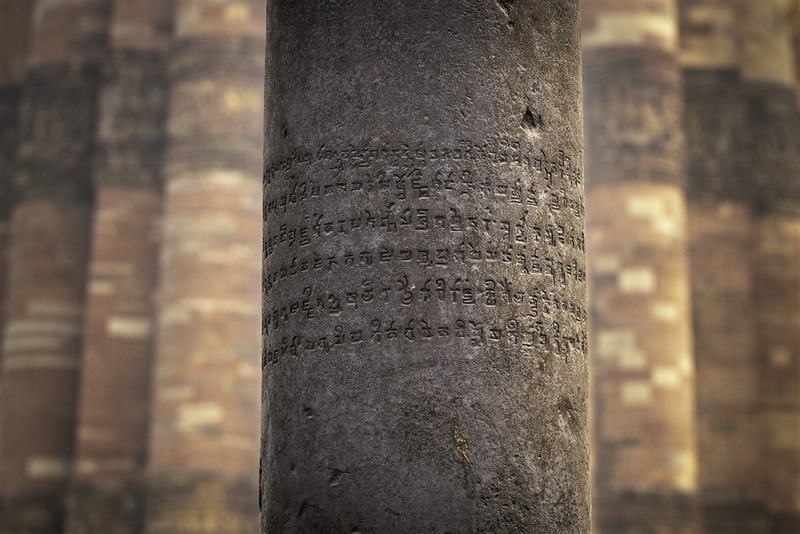 An inscription on the pillar states that it was erected by King Chandra on Vishnupada Hill. It is thought that King Chandra is likely to be Chandragupta II, a Gupta period emperor (375 A.D. – 415 A.D.), but the exact location of Vishnupada Hill remains a bit of a mystery. 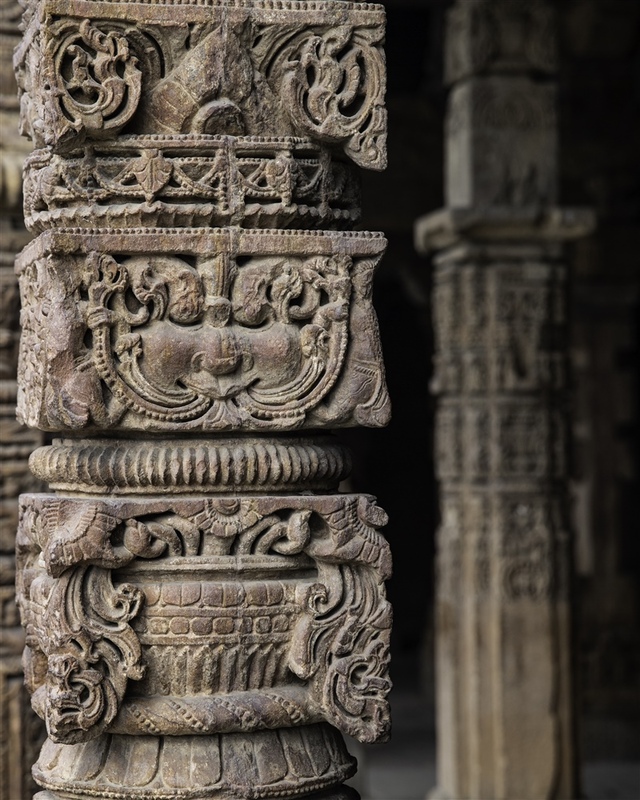 The pillar is believed to represent the staff of Vishnu, and quite likely once had an image of the eagle god Garuda (Vishnu’s vehicle) on the top. Clearly at some point this pillar was removed from its original location and placed here. With the difficulties of moving such an object it would perhaps imply that Vishnupada Hill was nearby, but the quality of the pillar also suggests that it originated from an important center of power, and none existed at that time around Delhi. 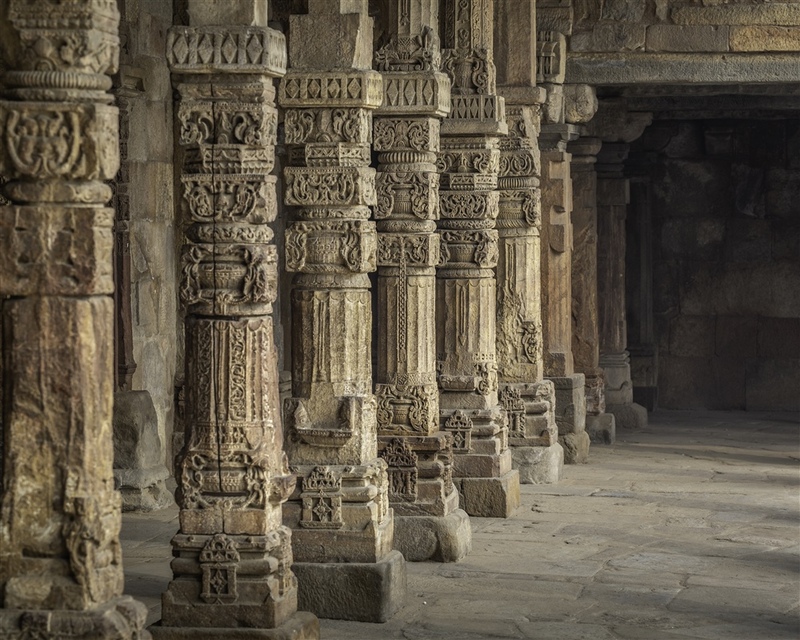 The pillar is a testament to early Indian metallurgical skills. It doesn’t rust, and nobody is quite sure how the pillar was cast. Such techniques in casting iron were not in use elsewhere until the 19th century in Europe ! Analysis of the metal used and the nature of the inscription has led some to suggest that it was originally erected at Udaigiri Caves in Madhya Pradesh. 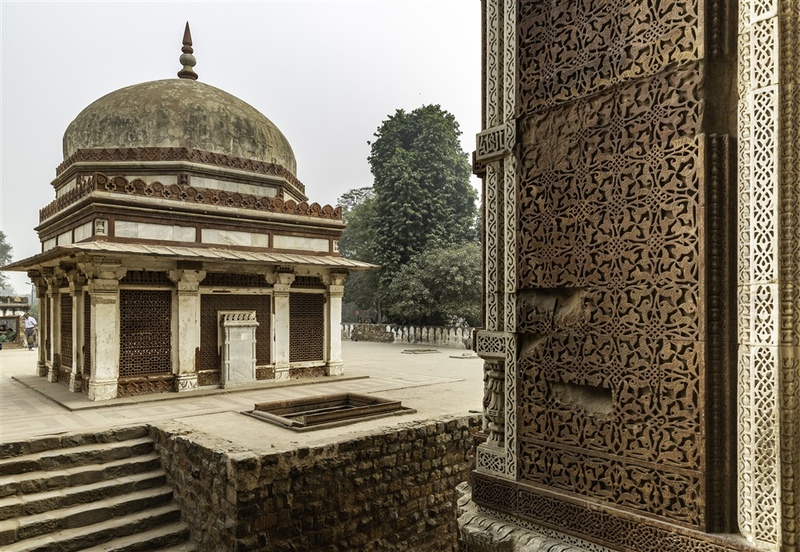 Built in 1235, this early Sultanate building is a lavishly decorated tomb filled with elaborate calligraphy and geometric decoration. 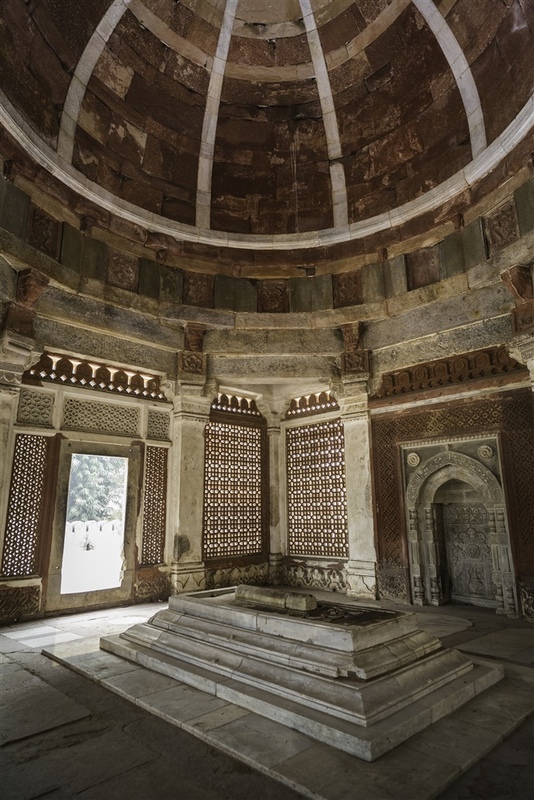 The structure originally had a dome, which makes this the earliest domed building in the whole of India. 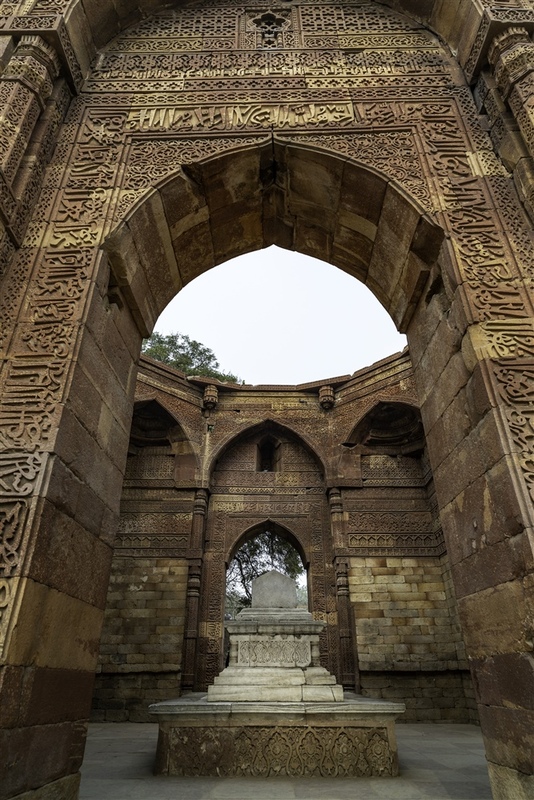 Erected in 1311 by Alauddin Khilji, this is one of the earliest buildings in India to employ the Islamic principles of arched construction. This structure was part of an intended plan to double the size of the Quwwat-ul-Islam Mosque, but none of the other proposed buildings were ever completed. Built on a platform beside Alai Darwaza, nothing is known of Imam Zamin, but he clearly had a close association with the mosque. 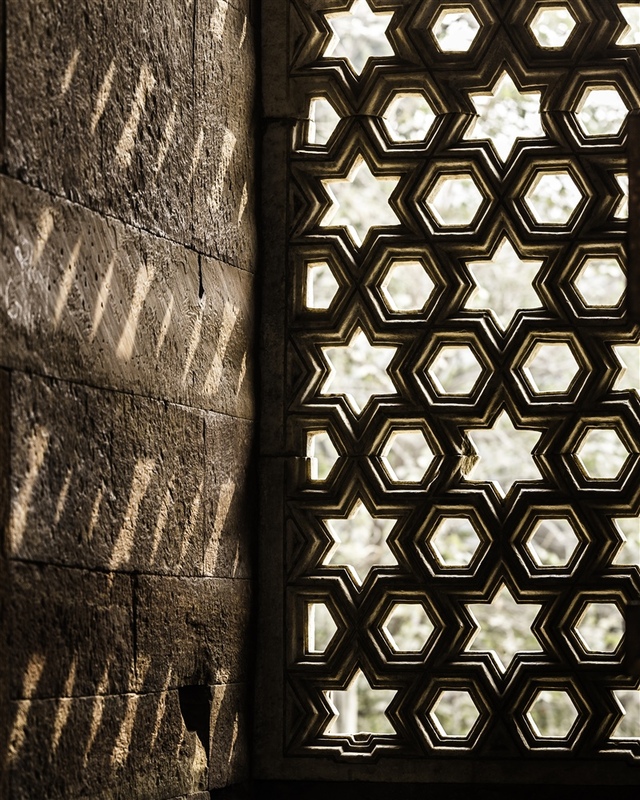 The tomb is typical of its time, with some wonderful Jali screens enclosing the chamber. 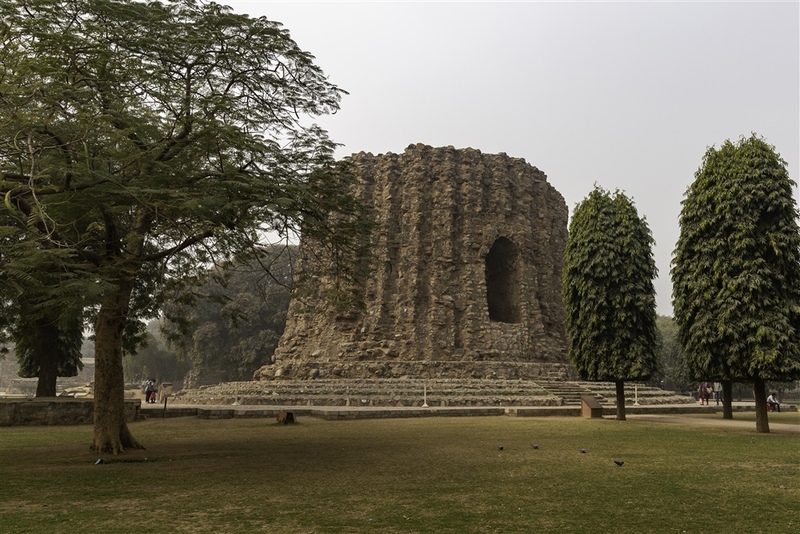 Begun by Sultan Alauddin, this structure was intended to be more than twice the height of the Qutb Minar, but today only an enormous stump remains. 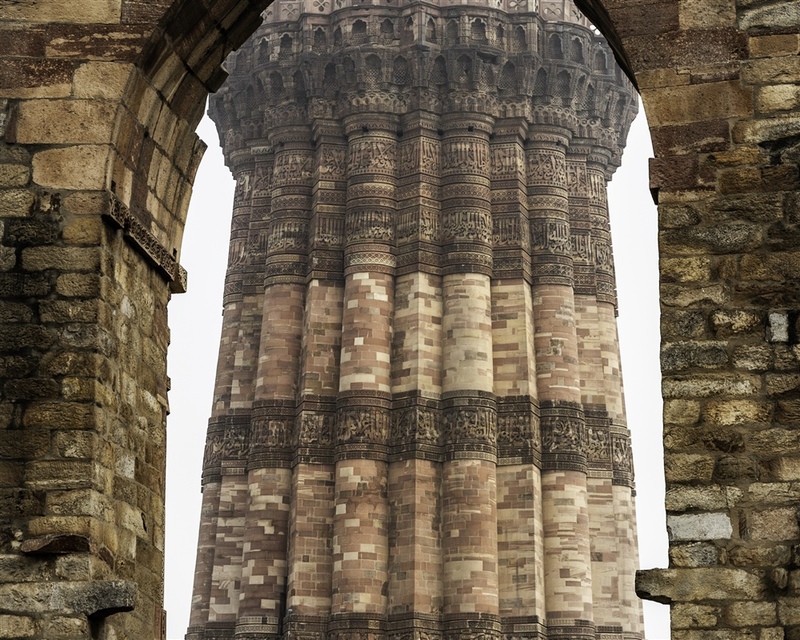 That concludes the mini photo tour of the Qutb Minar Complex. I would normally recommend getting there early to avoid the crowds, but depending on the time of year you may be faced with difficulties actually seeing some of the monuments ! So perhaps late afternoon might be more preferable, depending on the season and climatic considerations. 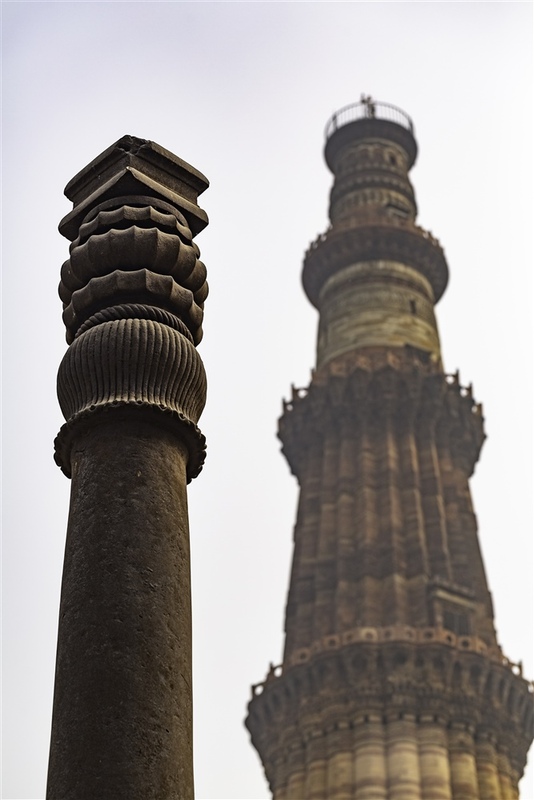 The Qutb Minar complex is open seven days a week, sunrise to sunset. Many good and rare views of the complex Kevin…liked the view of iron pillar and Qutub Minar together…we also visited this place a month or two ago…here is the link May be you will like some of the photos..
Hi Kevin, was recently planning for a vacation at Rajasthan and your blogs along with the amazing photos really came as an inspiration ! Started following you & hence here. 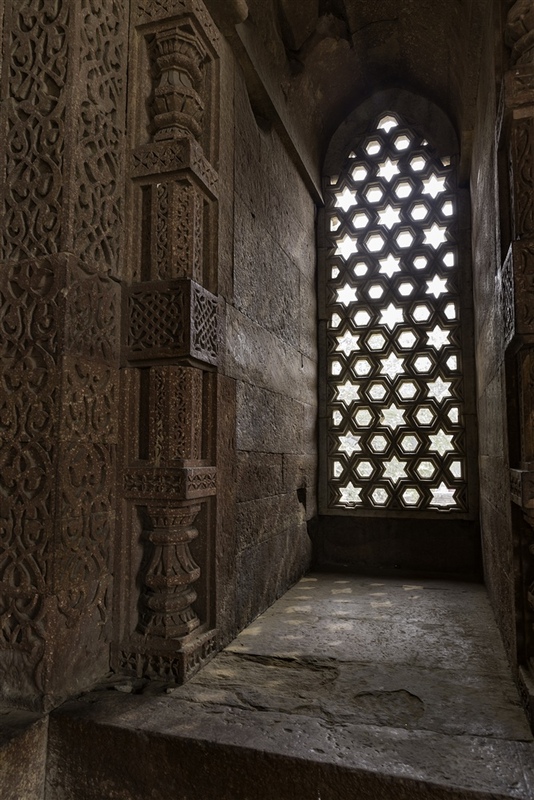 Similar to @HHY, here’s some of my pictures of the Qutub Complex. May be you’d like a few ! Thanks Rajib ! Glad my posts have helped you in some way. I’m heading back early next year to see my friends in Pune, and them spending a few weeks around Gwalior and Agra. So more content will be coming quite soon :). Thanks for your comments, and for stopping by ! Where are you heading to in Rajasthan ? Unfortunately not enough days to really soak in the local charm ! That’s quite a road trip, but you seem to have planned it pretty well. When are you heading off ? Hope, the next amazing blog of yours [Agra, Gwalior, Pune] coming soon .. Missed your posts of late. Good to see you back. It seems as if you missed the crowds. It was much more crowded when I was there. Nice shots, my friend.